KATIE TWEETED THIS GREAT PHOTO TODAY OF HER ADORABLE SELF AND THE PORTRAIT I DID OF COOPER!!!! Katie Couric was the KEY NOTE speaker at my very ever first blogging conference. She is so adorable and sharp and beautiful and flexed her muscles and I felt like she was talking to ME!!! It was not MEAN and it was NOT dismissive…it was just a great advice…and what I took away from that was that YOU/ME/I am have limited control over how others see us but CAN control how we see ourselves…..sure..aging can be a serious pain…on all fronts….on the other hand…aging is a GIFT!!!! Many people don’t get to grow older, fix mistakes, see grandkids or just another sunset…I JUST LOVED her! She inspired me to be VISIBLE!!! 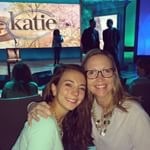 PHOEBE AND I AT THE KATIE COURIC SHOW – I lost my phone that night and all i have was the image I posted to instagram that day!!! 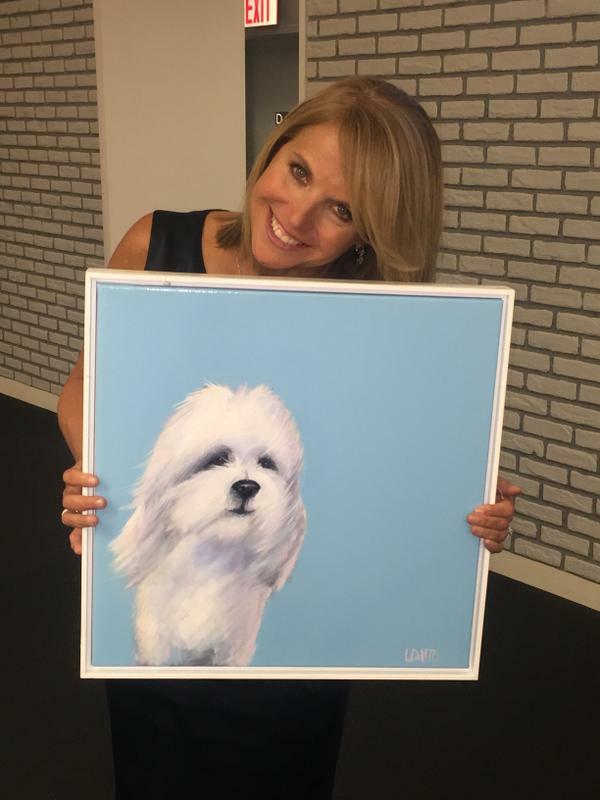 KATIE COURIC ROCKS AND PAINTING HER DOG COOPER WAS A BLAST!!!! So exciting, Lesli! I love the wind blown look in Katie’s portrait! Thank you Caley! the painting is called “Cooper on the Beach” ! Previous Post WHY I BLOG AND 48 HOURS LEFT TO VOTE!! Next Post MONDAY MAKEOVER – BOOT WEATHER!